Three luminaries that showcase common traditions and sentiments, which help us thrive through the challenges of our darkest season. Dark of Winter, a book in Alpine-glow colors of a winter sunset, speaks on contemplating the past year. Celebration, painted with evergreens, reminds us of joys to be found during the winter season. Returning Light, in spring sunrise colors, urges us to think hopefully on the coming year. The books sit on pedestal boxes, including five in-set, flame-less, LED candles, lined with metallic paper for added luminosity. Prose, lettering, page decoration, and binding by the artist. The colophon, in-set under the box top, is signed, numbered and dated. Please see my website for full descriptions and images. 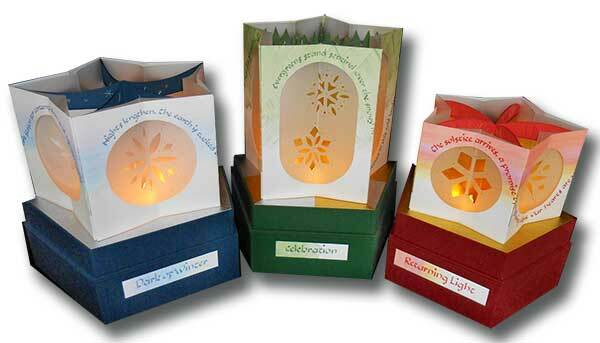 The three luminaries range from 10"-12" wide, and 9.75"-13" tall. Each an edition of 11, based on size, $2,750 / $3,000 / $2,500.